Caro SaintVire grew up in a family of artists. 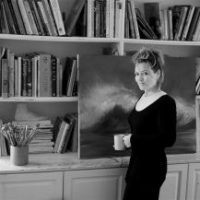 Her mother is a portrait painter with clients all around the globe, her grandfather was a painter and sculptor. Caro graduated from the University of Brighton with a first class degree in Fine Art and took postgrad courses at Chelsea College of Art and Design whilst honing her style and technique. She works within the field of abstracted realism, inspired by the breathtaking natural world around us. Living abroad in the Swiss Alps gave her an enormous appreciation of mountains, big skies and glorious space. Much of which informs her work. Her travels around Europe and the spectacular landscapes and skies of the USA are all influences in her subject matter. Living on the South Coast of the UK she continues to be inspired by the sublime skies, sunsets and sunrises which are on show almost daily. Caro’s artistic practice continuously explores the creative process and that inner part of the imagination that sparks inspiration, and each new painting reflects that process.